There are 2 different types of settings that must be configured in JV-Relatives. First is the component configuration and the other is the module/plugin/field configuration. In this article you will learn to configure settings in the JV-Relatives component configuration in back-end. To get started, please login to your site back-end, and go to Components - JV-Relatives. Click on the "Configuration" menu to the left. You can select the style that will be used for JV-Relatives in site frontend while displaying related articles. Style determines the set of files to be used to render the related articles output. Currently there are 3 different types of styles. They do not differ in the output or the layout. Default: Use this if your Joomla template is using Twitter Bootstrap 2.3.2 version. Defaultbs3: Use this if your Joomla template is using Twitter Bootstrap 3.x version. Legacy: Use this if your Joomla template does not use Twitter Bootstrap. You need to check with your template provider to know the version of Twitter Bootstrap that is used in the template. Decide if you want to open the related article in new window when clicked? This will be the text that will be displayed when no related articles, and no articles from same category (if that option is enabled) are found. If you leave this blank, then nothing will be displayed (including the caption) if no related articles are found. Please note that, this text will be shown only for those users who have the permission to manage JV-Relatives component (typically administrators) and not to guests or others. If yes, then a message to administrator that the article does not have related articles will not be displayed. This is the text that will be displayed when there are no meta keywords configured for the displayed article. If you leave this blank, then nothing will be displayed (including the caption) if there are no meta keywords configured for the article. Please note that, this text will be shown only for those users who have the permission to manage JV-Relatives component (typically adminstrators) and not to guests or others. Provide a comma separated list of keywords, that you want to ignore during scanning of related articles. Please leave it blank, if you do not want to use this feature. This option restricts the related articles scan to articles of specific author. Please provide the ID of the user here. Give a value of 0 to disable this option. With this option, you can display related articles which have been published anytime in the last n days from today. 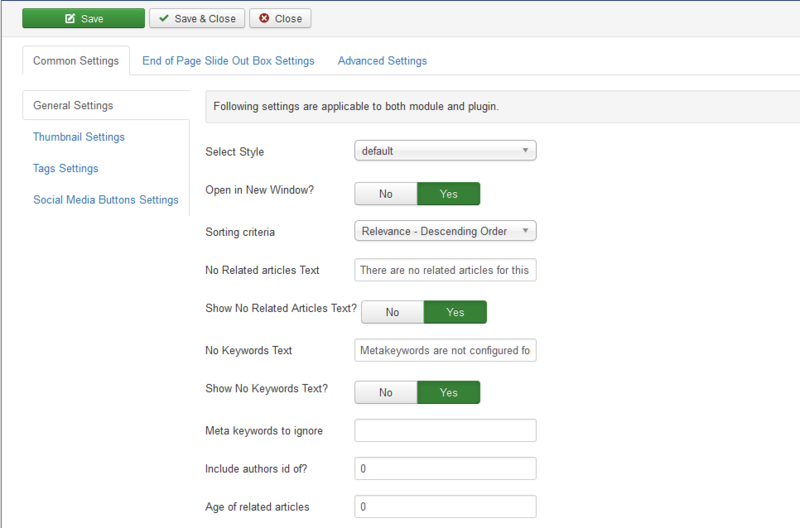 For example, if you set the value for this option to 60, then only those related articles which have been published in the last 60 days will be displayed. This ensures that, displayed related articles are recent ones as well! JV-Relatives can generate and display thumbnails of images inside related articles and show them alongside the related article listing. Following are the settings available for thumbnail generation and display. You may switch off or switch on thumbnail display and also configure additional parameters from individual module/plugin/field configuration. If yes, then the thumbnail will be hyperlinked just like the title of the related article. You may choose a default thumbnail image that can be displayed when the related article does not have an image in it. If you leave this field empty, then the default thumbnail image will not be shown when the related articles does not have an image. Provide the html code to display social icons. You can get the html code by creating a free account at www.addthis.com or shareaholic.com. Click on Tools menu at the top. Scroll down the page and go to the Share Tools section. Select the "Share Tool" that you want to display and click on "Get Code" for it. Copy those 2 sets of code and paste them into the above text area field in JV-Relatives field. If you have already not added your site, then please do that first. Go to Website Dashboard and click on "Get Setup Code"
Click on "Add App Location" and choose "Share Buttons"
In the next screen configure the buttons as you wish and then "Save Settings". These determine the settings for the related articles slider that comes out from right bottom of the page, as visitor reaches the end of the article. Please read the "End of Page Slide Out Box" article for configuring these settings. Set to Yes, only if your Joomla template is not loading Twitter Bootstrap CSS. If yes, JV-Relatives will load Twitter bootstrap 2.3.2 css file that is bundled with Joomla. If in doubt, please contact support at jv-extensions.com. If yes, then "Powered by JV-Relatives" will be displayed below the related articles block of display in site frontend. If Yes, then JV-Relatives will log all debug output to a file in your temp folder. To view the log file, go to JV-Relatives Dashboard and click on "View Debug Log". You also have the option to delete the debug log from with in the debug log area, and export it while contacting support. If yes, then the related articles output of JV-Relatives will be cached and the cache output will be displayed on further page refreshes of the displayed article. This value is in minutes. The cache will be recreated once this duration elapses. You may also clear the cache using "Clear Cache" link in back-end dashboard.